For most engineering majors, mathematics is a required part of the examination. Here is a question from ordinary differential equations. Illustrate through an example that the global truncation error in Euler’s method is proportional to the step size. When solving a fixed-constant linear ordinary differential equation where the part of the homogeneous solution is same form as part of a possible particular solution, why do we get the next independent solution in the form of x^n* possible form of part of particular solution? Show this through an example. Repeated roots in ordinary differential equation – next independent solution – where does that come from? When solving a fixed-constant linear ordinary differential equation where the characteristic equation has repeated roots, why do we get the next independent solution in the form of x^n*e^(m*x)? Show this through an example. See this pdf file for the answer. Author Autar KawPosted on 9 Jul 2014 9 Jul 2014 Categories Numerical Methods, Ordinary Differential EquationsTags Ordinary Differential Equations, repeated roots2 Comments on Repeated roots in ordinary differential equation – next independent solution – where does that come from? Taylor polynomial is an essential concept in understanding numerical methods. Examples abound and include finding accuracy of divided difference approximation of derivatives and forming the basis for Romberg method of numerical integration. In this example, we are given an ordinary differential equation and we use the Taylor polynomial to approximately solve the ODE for the value of the dependent variable at a particular value of the independent variable. As a homework assignment, do the following. 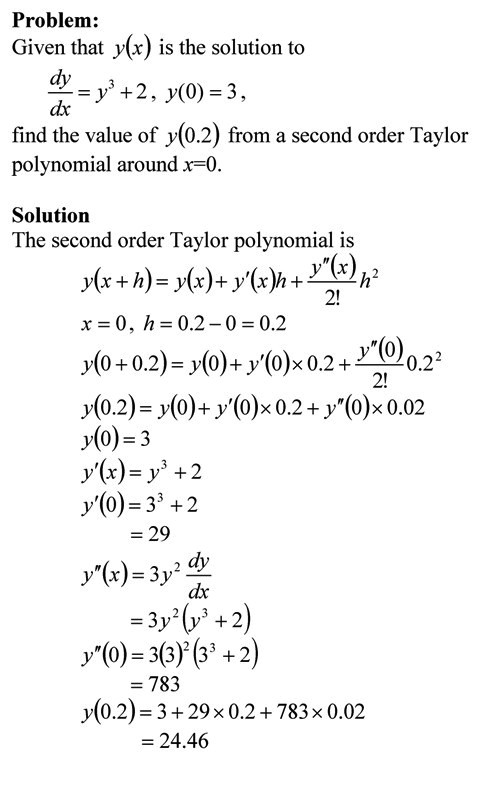 2) get another approximate solution by using a third order Taylor polynomial. You can visit the above example by opening a pdf or video file. This post is brought to you by Holistic Numerical Methods: Numerical Methods for the STEM undergraduate at http://nm.MathForCollege.com, the textbook on Numerical Methods with Applications available from the lulu storefront, the textbook on Introduction to Programming Concepts Using MATLAB, and the YouTube video lectures available at http://nm.MathForCollege.com/videos. Subscribe to the blog via a reader or email to stay updated with this blog. Let the information follow you. Author Autar KawPosted on 20 Oct 2009 20 Oct 2009 Categories matlab, MATLAB programming, Numerical Methods, Ordinary Differential EquationsTags matlab, ode45, Ordinary Differential Equations2 Comments on How do I numerically solve an ODE in MATLAB? How do I solve a boundary value ODE in MATLAB? Many students ask me how do I do this or that in MATLAB. So I thought why not have a small series of my next few blogs do that. In this blog, I show you how to solve a boundary value ordinary differential equation. % How do I solve a boundary value ordinary differential equation? % boundary value ordinary differential equation. Author Autar KawPosted on 25 May 2009 3 Sep 2009 Categories matlab, Numerical Methods, Ordinary Differential EquationsTags matlab, Ordinary Differential Equations1 Comment on How do I solve a boundary value ODE in MATLAB?